Besides the older seedlings, clamoring to get out, we’ve been starting new guys as well, for later planting. 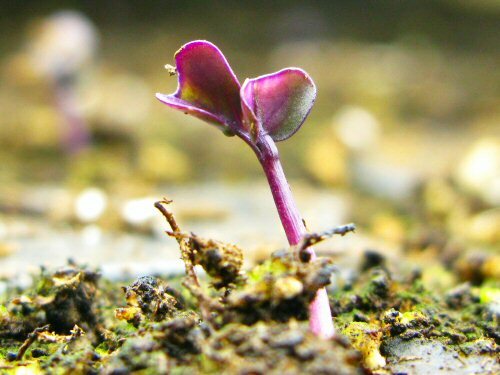 Here, a few days after emerging, a baby Cairo (hybrid) red cabbage, for crowded growing (12″ spacing), to produce “baby,” “gourmet” cabbages—basically, small ones! Elsewhere, Brussels sprouts, savoy cabbage, bok choi, and more. And it’s time for a second set of broccoli and cauliflower, to follow up the first wave. In our short May-September main growing season, now’s the time… Tick-tock! Interesting … I have heard that mini-vegetable are very trendy these days. I guess, if you can grow something that require less field space, get to marketable size sooner and command a premium, you *ought* to do it! Good luck with the baby cabbages.